So Facebook’s “memories” thing is occasionally useful — today it reminded me that literally two years ago, it went public that Lynne Marie Thomas and Michael Damian Thomas were starting a brand new SFF magazine, Uncanny, and that they’d tapped me as Managing Editor. 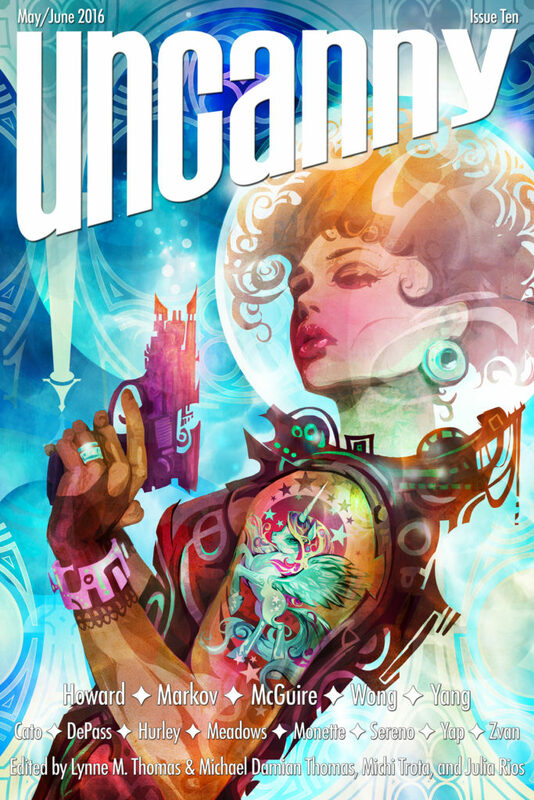 On July 29, 2014, we launched the Kickstarter for Uncanny Magazine Year One — honestly I had no idea if we’d fund but just being asked and being able to say I was a part of this project was one of the proudest moments for me ever. And here we are two years later — Uncanny‘s had pieces from Year One nominated for 14 different awards and included in 6 different Year’s Best anthologies. Uncanny is both a Hugo Award and World Fantasy Award finalist, and I’m the first Filipina Hugo finalist in any category. I can now call Lynne, Michael, Deborah Wilson Stanish, Amal El-Mohtar, Steven Schapansky, Erika Ensign, Julia Rios, Claire Suzanne Elizabeth Cooney not just professional colleagues (as well as people I’ve fanned out over), but friends as well. I’ve gotten to work with some of the best fiction, nonfiction, poetry, and illustrative arts creators in the genre. I can now name more Filipinx SFF creators than I can count on both hands, several of whom we’ve published in Uncanny (I read Isabel Yap, Alyssa Wong, and M Sereno‘s work for the first time in Uncanny‘s pages). Late last night Uncanny‘s Kickstarter for Year Three hit our funding goal, and we’re steaming toward our stretch goals with three weeks in the campaign to go. Galen Dara, killing it with original cover art for Issue 10 called “Bubbles and Blast Off” and giving me future tattoo sleeve goals. I’m so very, very thankful for the last two years, and to Uncanny‘s amazing staff for their passion & dedication; in particular to Lynne and Michael for inviting me into this amazing community, and to my spouse, Jesse Lex, for being so incredibly supportive (even when we’re burying him in submissions to read). Because of the Space Unicorn Ranger Corps — Uncanny‘s growing, vibrant, and amazingly inclusive community of supporters — we get to keep this genre-expanding, creatively challenging, incredibly inspiring journey going. Thank you for keeping this dream going for me, for my Uncanny family, and for everyone who believes in an inclusive SF/F that provides support, encouragement, and visibility for everyone, especially those who’ve been marginalized in the genre. I’m proud to have written pieces in support of Uncanny‘s Kickstarter for Mary Robinette Kowal’s My Favorite Bit and The Book Smugglers, highlighting how much Uncanny‘s mission statement and ethos means to me. So. Let’s keep the party going, Space Unciorns. STRETCH GOALS AHOY!! This entry was posted in Fandom and tagged diversity, inclusion, Kickstarter, Uncanny, visibility, Year Three by Michi Trota. Bookmark the permalink.